On the women's side, I really enjoy the way J. Crew continues to expand their reach with fresh plays on pattern, color and texture. We're so far from the catalog-only days I can hardly remember them at all. As far as the menswear goes, mmm. Ok, fine. The colors are rich but not obnoxiously so, and the layering is modern but accessible to most guys. At least, I'd hope. I'm kind of obsessed with the purple shorts, and would probably die happy if every guy introduced a little sockless ankle cleavage into their life. 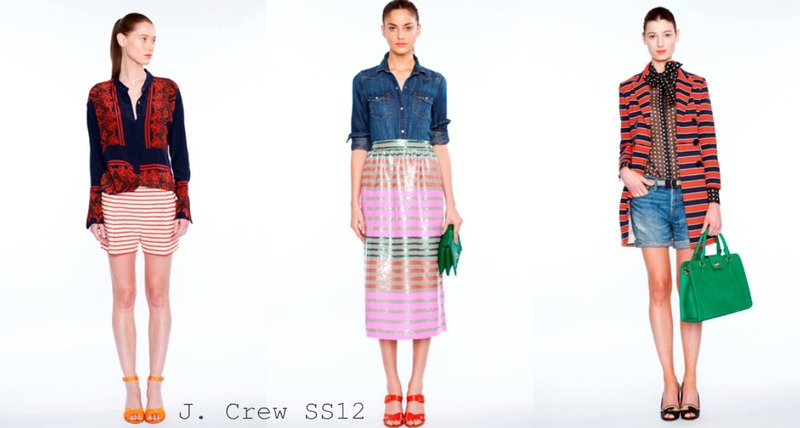 J.Crew continue to impress me season after season. There is always something new and exciting! Loved what I saw from the SS12 presentation. I'll take it all, please! totally amazing! they're still is so classic yet so incredible and modern at the same time. stripes galore. LOVES!